Each year Franck Muller presents a super-complication at the World Presentation of Haute Horlogerie (WPHH) held at a chateau in Genthod, located on the outskirts of Geneva. In 2006 Franck Muller amazed watch experts and collectors from around the world with the unveiling of its "everlasting timepiece" the Aeternitas, a watch that would run 1000 years without correction. This year brings 4 new versions of the Aeternitas Mega which for the first time include a Grande and Petite Sonnerie (Grande-strike) Minute Repeater, Westminster Carillon. One may ask, why would we care if our watch has a 1000 year calendar? But this is no small accomplishment, and its one that has been appreciated by enthusiasts of complicated movements. The eternal calendar, not to be confused with the traditional perpetual calendar, follows a cycle of 1,000 years thanks to two additional sets of wheels. Franck Muller's eternal calendar is different from any traditional perpetual calendar because it takes into account the rule governing the Gregorian calendar stating that all century years not divisible by 400 are common years and not leap years. The Aeternitas Mega 1 has the addition of a Grande and Petite Sonnerie Minute Repeater, Westminster Carillon. The movement is equipped with a double barrel which work to guarantee a power reserve of 4 days and provide energy for the Sonnerie. The Grande Sonnerie (Grand-strike) strikes the hours and the quarters automatically that chimes the same notes as the clock tower of the Westminster cathedral. The Petite Sonnerie only strikes the hours and the quarters. The Aeternitas Mega 2 incorporates a Split-seconds Chronograph with a 30-minutes counter placed at 3 o’clock and an hour counter placed in a retrograde sector. While the Aeternitas Mega 3 has an eternal calendar module placed on the dial side which indicates the day, the date, the month and the moon phases and requires no manual intervention. The grand finale, the Aeternitas Mega 4, incorporates all the aforementioned complications from first three versions into one stunning watch. The most complicated wristwatch ever created by Patek Philippe is the Sky Moon Tourbillion reference 5002. Like Vacheron’s Tour de L'Ile it too is a double sided watch, the first of its kind for Patek Philippe. It was released by Patek in early 2001, shortly after the unveiling the Star Caliber 2000, rising to the challenge of producing such a masterpiece in wristwatch form. 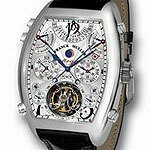 These watches are extremely rare and sell for well over a million dollars. In 2007 Antiquorum sold a rose gold Sky Moon Tourbillion at auction for $1,240,400. The extreme difficulty of producing such a complicated watch had limited production to just 2 a year, one platinum and one rose gold. Recently production has been changed to include a white gold (5002G), and a yellow gold (5002J) model. The 42.8mm case houses 686 parts working together to create 12 separate complications. On the fist side the dial contains a perpetual calendar with the leap year cycle at 12 o’clock, month at 3 o’clock, day at 9 o’clock and a retrograde center date hand. The phase of the moon is shown at 6 o’clock, and center hands show the hour and minute. The minute repeater chimes with two cathedral gongs. There is also a hidden tourbillion. The crown at 4 o’clock is for the setting of time and winding. On the reverse side a beautiful blue dial displays a skychart and the phase and orbit of the moon. Sidereal time is shown with center hour and minute hands. A crown at 8 o’clock sets the 24 hour scale as well as the sky/moon indications. Unlike many other watches that reach this level of complication, Patek Philippe is still producing a very limited amount of the 5002’s each year. At such a steep price it is a lucky few that are able to call one of these masterpiece their own. When it comes to the most complicated timepieces, the International Watch Company has created one of the most spectacular examples. Produced to be released on their 125th anniversary in 1993, the IL Destriero Scafusia was the world’s most complicated wristwatch created to date. IL Destriero Scafusia which means “The Warhorse of Schaffhausen,” was designed by a young watchmaker named Richard Habring. The Destriero was painstakingly created from 750 individual parts, and has a total of 21 complex functions and displays. This watch is limited to just 125 pieces and only about 10 per year were produced until 2003. The 42.5mm case was made in either 22 carat rose gold or solid platinum. The elegantly hand engraved back was fitted with a see-through case back made from non-reflecting sapphire crystal. The movement created for this watch is the Caliber 1868-15.75 which not only has 750 parts, but also contains 76 jewels for the minimal amount of friction. The tourbillon alone contains 100 individual parts. On the silver dial are four sub-dials, with three of the dials serving an alternate purpose. The moonphase dial which doubles as the 30 minute chronograph totalizer is at the 12 o’clock position. At 3 o’clock is the date, followed by the month and 12 hour chronograph totalizer at 6 o’clock. There is also four digit year display in between the seventh and eighth hour. The final sub-dial at the 9 o’clock position is for day and constant second. In addition to all of these functions there is an integrated flying tourbillion that can be seen on back of the watch. The watch to have most recently won its way onto this most prestigious of lists, was created in 2005 by Vacheron Constanin. A watch by the name of Tour de L'Ile, valued at a jaw-dropping $1,500,000, is the most complicated double-face wristwatch ever created boasting 834 parts and 16 complications. Completed the year of Vacheron’s 250th anniversary, the development of this timepiece took five years and more than 10,000 hours to create. With seven pieces created, and only six of those having been released to the public this watch is indeed one of the rarest and most sought after wristwatches ever created. The caliber 2750 movement is unique to this watch, made up of 834 parts. An assembly this complicated can take up to 5 months to complete. In addition to hour, minute and second indicators this watch has 16 complications which have been divided between the watches two sides. The first side’s most prominent feature is the tourbillion, which has an oversized cage almost twice the size of any other feature. The tourbillion shines on a dial made of silvered 18k gold guilloche. Above and to the left of this is the power reserve which sits directly across from the moon-phase indicator. Finishing up the complications on this side are the second time zone and a smaller sub-dial which indicates the torque of the striking-mechanism. The dial on the back of the watch contains functions laid out in almost perfect symmetry, crowned by a perpetual calendar whose features include day, date, month, and leap year indicators. In the center position is a dial dedicated to the equation of time. Below on either side are two astronomical indications for sunrise and sunset times. Finally, at the bottom of the dial is an extremely precise sky chart of the northern hemisphere. The Tour de L'Ile is a breathtaking example of all that is fine in horology and I imagine will continue to inspire for as long as time continues to move forward. And though I believe it is just a matter of time before it has been outdone this watch has taken its place in history as one of the most complicated watches ever created. Continue reading "Most Complicated Wristwatches Ever Made / Part 1"